The story in one sentence: After a sniper, who randomly shot five innocent people gets arrested his only request is to get Jack Reacher. Storyline: Five innocent people get shot by a sniper. It doesn’t take too long to figure that the shots came from a parking garage, and through a random check of a meter the police finds the finger prints of an ex-military sniper on one of the quarters. When Barr (Joseph Sikora) gets arrested it seems to be a solved case, but instead of writing a confession he asks for Jack Reacher, an ex- military police officer who disappeared years ago. 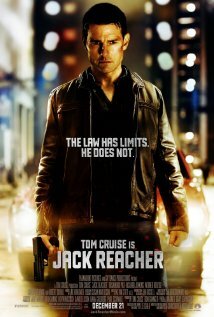 Surprisingly Reacher (Tom Cruise) shows up even though he wasn’t informed about the supect’s request. He obviously has a bone to pick with Barr, but when he finds out that Barr didn’t confess and asked for him he questions if Barr really committed the crime. My Review: I didn’t expect much from this movie, but in the end I was pleasantly surprised. I was entertained, kept guessing what actually happened, and liked the ending. It was a decent action thriller with good story and actors. I don’t think we can ask for more. There was no wow effect but I was pleased with Tom Cruise’s performance. I don’t understand why he has so many haters, I mean yes, he is a follower of Scientology – if not even one of the leaders. But what does that have to do with his acting skills? Sure, he is acting a certain way and it doesn’t really change, but that’s why he sticks with a specific genre which works for him. Frankly, I don’t care what someone does unless it harms others, and I couldn’t care less about Scientology as long as they don’t try to recruit me. That being said, I think Jack Reacher is a very fast paced action thriller with good story and differnt twists. The perfect movie for a boring rainy day. I expected the same thing, just dull and boring, but it was really good! How bad was Tom Cruise in it? I find him so over the top, it’s annoying (in many films but not all). Classic Tommy? Well, I think I he actually did a decent job. It’s not as over the top as the M:I movies. Thanks! Collateral was my favourite movie with him. Likely because he was completely different than his typical self, ala War of the Worlds style. It’s not a Collateral performance, i can tell you that one. 🙂 I agree that this was probably his best performance. I liked Eyes Wide Shut, too! If you like action with a decent storyline you will like Jack Reacher.